To prevent the country from descending into civil war between the two strongest claimants to the throne, Robert the Bruce, 5th Lord of Annandale, and John Balliol, Lord of Galloway, the Guardians invited Edward I of England to intervene. Edward accepted on the precondition that he be recognized as Lord Paramount of Scotland, feudal superior of the realm, during the arbitration. Once his condition was reluctantly accepted, Edward presided over a council composed of 104 auditors to decide which claimant had the right to the throne. After lengthy proceedings, the council ruled in favour of John Balliol, who was enthroned at Scone in November 1292. But Edward soon revealed that he had no intention of dropping his claim to Scotland and treated it as a vassal state, involving himself in its legal and political affairs. He had expected Balliol, who would face war with Bruce's faction without England's backing, to be compliant. However, the nobility quickly tired of Edward's presence; and when England demanded in 1294 that Balliol provide it with troops and funds for its intended invasion of France, the Scots community balked. The leading men of the country gathered in a hastily-convened parliament to select a twelve-member war council to advise Balliol, who renounced his fealty to Edward and sought the support of Phillip IV of France. Scotland and France negotiated a pact of mutual assistance in the event of war against England, commonly referred to as the Auld Alliance. When Edward became aware of the secret Franco-Scottish negotiations in 1295, he began to strengthen his northern defenses in preparation for an invasion and ordered Balliol to relinquish control of the castles and burghs of Berwick, Jedburgh, and Roxburgh. In response to England's mobilization, Balliol summoned the armies of his noblemen. Some nobles, however, ignored the summons, including Robert the Bruce, Earl of Carrick, whose father's Annandale estates had been seized by Balliol and given to John "the Red" Comyn. The English army outnumbered and outmaneuvered their Scots adversaries. After John de Warenne, Earl of Surrey, defeated Balliol, his own son-in-law, at the Battle of Dunbar in April, the war of 1296 effectively came to an end. Scotland could offer no more serious resistance. Balliol was taken prisoner, and in July he was ceremoniously stripped of his royal vestments at Montrose Castle. Edward then marched as far north as Elgin, taking oaths of fealty from Scots lords. On his journey back to England in September, Edward confiscated the sacred symbol of the Scottish monarchy, the Stone of Destiny, from Scone Abbey in Perth and carted it to Westminster Abbey, where it would remain interned for centuries. Scotland had been subdued. Edward appointed the Earl of Surrey as Scotland's overseer. English soldiers took control of Scottish castles, followed by English tax collectors who exploited the populace for personal gain. Widespread alarm followed with news that Edward planned to conscript Scots armies to serve in Flanders in the war against France. Although Scotland had been an easy conquest, it lay restless under English rule. The fealty sworn to Edward by Scots lords allowed Edward to rule Scotland without a large occupying English force, but English officials questioned their ultimate loyalty. Discontent stirred among the nobility; violence erupted in Ross, Argyll, Galloway, and Fife. Andrew Moray, a powerful and influential nobleman, had been captured at the Battle of Dunbar and was held in Chester Castle on the south-eastern border. Sometime during the winter of 1296-97, he managed to escape by means that have been lost to history. He returned to his father's castle at Avoch, and in May 1297 he raised a banner of rebellion in the name of the exiled king, John Balliol. Supporters rushed to his side as he repelled English soldiers from their garrisons in the castles at Banff and Inverness. Soon he had liberated all of Moray. Around the same time, William Wallace killed the English Sheriff of Lanark, marking the beginning of a second rebellion in the Lowlands. With the blessing of Robert Wishart, the Bishop of Glasgow, Wallace rampaged through the centre of the country while Moray seized control of the Highlands. By late summer, Dundee was the only castle north of the River Forth left in English command. The Earl of Surrey, finally forced to take decisive action, gathered an army and marched towards Stirling, where the combined forces of Moray and Wallace joined together. Their triumphant victory at the Battle of Stirling Bridge marked the zenith of the early campaign. Moray, however, perished of wounds he received as he led his army in pushing the English out of Scotland. Wallace used the momentum to launch an invasion of northern England. 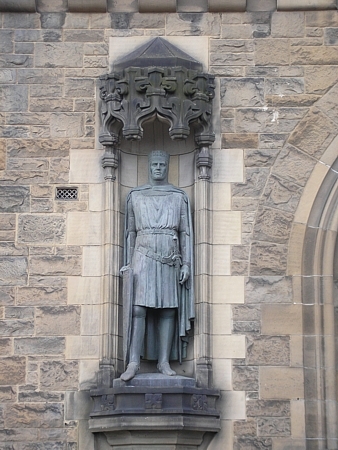 In March 1298, he was knighted and appointed Guardian of the Kingdom of Scotland in the name of John Balliol. But his reputation was ruined just four months later when he lost the Battle of Falkirk to Edward. Although Wallace lost the support of his most loyal men and his credibility as a military leader, Falkirk was not decisive as Dunbar had been. Edward's army, weakened by heavy losses, was in no position to move forward. The English retreated to Carlisle, where Edward hoped to regroup; however, much of his contingent deserted, and he was forced to dismiss the greater part of his army. Wallace, lacking an independent power base, resigned his Guardianship as the rebellion's leadership passed into the hands of the aristocracy. 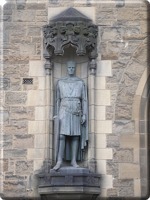 Robert Bruce and John Comyn, co-claimants to the throne, succeeded Wallace as joint-Guardians while Wallace went to France to seek aid from Phillip the Fair. Diplomatic pressure from France and Rome convinced Edward to release John Balliol into papal custody, but he would not pay heed to the Papal Bull condemning his occupation of Scotland. King Philip, however, soon became too inundated with domestic affairs to be of real help to Scotland, and the Pope's support for Scotland faded without French influence. Amid the chaos of the opening of the new century, Edward subdued more and more of the rebellious nobility. By 1304, Stirling Castle remained the last stronghold of resistance. After four months of constant bombardment by one dozen siege engines, it too fell. John Comyn negotiated terms of capitulation but refused to surrender unconditionally. He instead asked that prisoners of both sides be released by ransom and that Edward agree there would be no reprisals or disinheritance of the Scots. 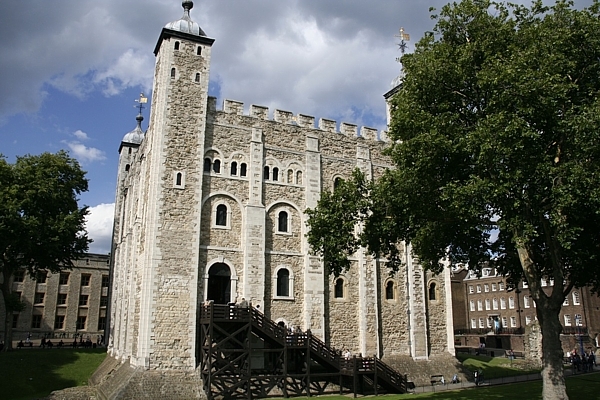 Fortified estates could be recovered through the payment of fines levied in accordance with each family's disloyalty, and inheritances would continue normally, allowing the landed nobility to pass on their titles and properties. The laws and liberties of Scotland would be as they had been in the day of Alexander III, and any that needed alteration would be with the advice of Edward and the advice and assent of the Scots nobles. While Edward rearranged Scotland's political structure to absorb it into England, William Wallace was finally captured at Robroyston near Glasgow in August 1305. After being found guilty at a public show trial at the Elms of Smithfield, Wallace was hanged, drawn and quartered. The rebellion came to a calm. Edward, however, had failed to quell the ambitions of powerful men. Although he had appointed Robert Bruce, among others, as an advisor to the Earl of Richmond, head of the subordinate government in Scotland, the English king remained suspicious of the Earl of Carrick, whose allegiance had wavered many times during the conflict. Bruce had much to lose if he riled Edward's fury: in addition to huge estates and properties in Scotland and England, he also had a large family to protect. If he claimed the throne, he would plunge the country into another series of wars; and if he failed, his family would suffer the reprisal. Bruce and John Comyn, his arch-rival and the country's most powerful nobleman, entered into an understanding that one of them would renounce his claims to the throne, but receive the lands of the other and support his claim. Comyn, however, attempted to get both the title and lands by informing Edward of Bruce's plans to be king. After Bruce's party intercepted a messenger carrying implicating documents in February 1306, Bruce confronted Comyn during a private meeting at the Greyfriars Kirk in Dumfries. The two quarreled; Bruce drew his dagger, stabbed his opponent, and fled. He and his followers then forced the local English judges to surrender the castle. With no alternative except to claim the throne or become a fugitive, Bruce went to Glasgow where Bishop Robert Wishart absolved him for the sin of Comyn's murder and urged Scotland's clergymen to support him. On 25 March 1306, Isabella MacDuff, Countess of Buchan, crowned Robert the Bruce King Robert I of Scotland in the name of the Earl of Fife. The Bishops of Glasgow, St. Andrews, and Moray and the Earls of Atholl, Mentieth, Lennox, and Mar attended the ceremony at Scone Abbey, which was conducted with all appropriate formality and solemnity despite the absence of the Stone of Destiny. Scotland would not give way to England. The Scots thronged to the new king as he launched another campaign to free Scotland from English rule. After a series of early defeats, it seemed as though Bruce's struggle had been in vain; the tide turned, however, in 1307 when Edward I, the Hammer of the Scots, died. 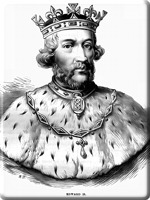 Edward's heir, Edward II, was little concerned with Scotland as he faced an increasingly hostile barony at home. Bit by bit, Bruce used Wallace's guerilla tactics to claw back all the land that Edward I had taken during his reign. By 1314, only Stirling Castle and Berwick remained under English control; moreover, two years had passed since the English launched a campaign into Scotland. Edward was forced to take decisive action after Bruce began a siege of Stirling Castle, but made a great error in thinking that the size of his army, composed of twenty-thousand foot soldiers and three thousand cavalry, would alone guarantee his success. The defeat that ensued at the Battle of Bannockburn was the worst an English army had suffered since the Battle of Hastings in 1066. Six years after Scotland won her independence at Bannockburn, fifty-one magnates and nobles signed and sent the Declaration of Arbroath to Pope John XXII. The declaration proclaimed Scotland's independence and sovereignty, asserting that it had always been independent, and that King Robert I had delivered its people from the peril of Edward I's unjust attacks and atrocities. 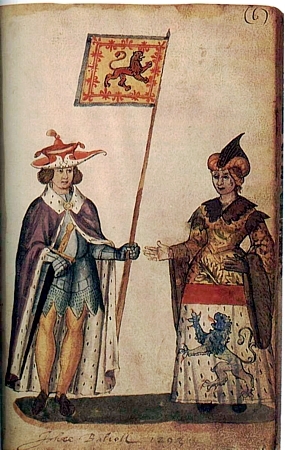 The declaration was also unique in its pronouncement that the people were the source of the monarch's power, emphasizing the right and duty of the nobility to depose of a monarch who threatened Scotland's independence, which was the prerogative of the people. The document ultimately shaped the history of Scottish national identity, creating an ideal of popular sovereignty. The Treaty of Northampton, signed in 1328, brought the First War of Scottish Independence to a conclusive end with England renouncing all claims over Scotland and recognizing the royal legitimacy of the House of Bruce. 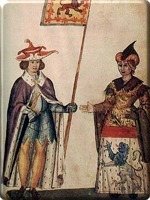 The treaty was overturned, however, a mere five years later when Edward III of England sought to claim the Scottish throne for Edward Balliol, son of John Balliol, over David, Bruce's son and heir. Sensing a renewal of hostilities with England, the Scottish parliament decided to coronate David Bruce as quickly as possible. The child was crowned David II of Scotland on St. Andrew's Day 1331, and was the first Scottish monarch to receive the papal honour of anointment. 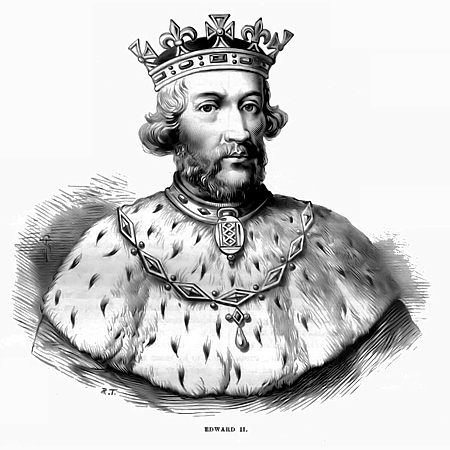 Edward III invaded Scotland in the spring of 1333. After successfully taking Berwick, the English king sought no further victories. He returned home while Balliol marched north, plunging Scotland again into civil war. After Edward realized the sheer scale of his concessions to Edward - the surrender of all of English-speaking Scotland - he faced another, greater threat: French involvement. As the next two years dragged on, Edward wearied of Balliol's cause and came to view the war in Scotland as a subtext for growing hostilities in Anglo-French relations. 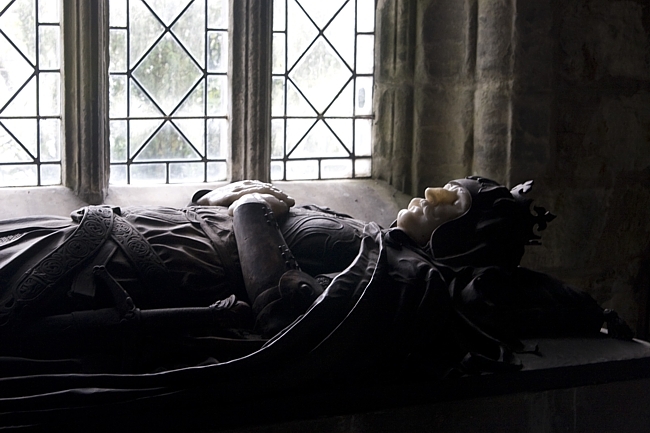 After the Hundred Years War broke out with France in 1337, Edward all but abandoned Balliol. Gradually the Guardian Sir Andrew Murray reclaimed all the castles held in Balliol's name. The political situation was stable enough in 1341 for David to return home. 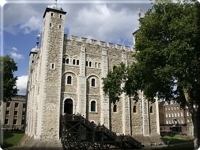 At the request of Philip VI, he invaded England in 1346, only to be captured at the Battle of Neville's Cross and sent to the Tower of London to be imprisoned. Balliol, however, achieved no success. 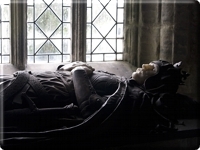 Aging and exhausted, he resigned his claims to Scotland to Edward in 1356 "to the end that you may avenge me of mine enemies, the infamous Scots, who ruthlessly cast me off that I should not reign over them." With Balliol out of the way, Edward concluded negotiations for Scotland. Although the Treaty of Berwick solved nothing but David's release - England's claims over Scotland remained unresolved and larges swathes of territory in Annandale, Berwick, Jedburgh, and Roxburgh were still under English control - the English monarchy never again attempted to replace a Scottish king or threaten the country's independence. As military action winded down to border struggles, peace fell across the rest of the land.